JAKARTA, -- A senior official from the Indonesian Navy (Tentera Nasional Indonesia - Angkatan Laut, or TNI-AL) has confirmed the deployment of Chinese-made C-705 surface-to-surface missiles on the service's KCR-60M missile attack craft. The official was speaking to IHS Jane's on 19 May during a visit to the second-in-class KCR-60M vessel KRI Tombak at Changi Naval Base during the IMDEX 2015 exhibition in Singapore. The TNI-AL sent two ships to the expo - the other being the Bung Tomo-class corvette KRI John Lie (358). Tombak , built by Indonesian state-owned shipbuilder PT PAL and commissioned in August 2014, is the second of three KCR-60M ships currently in service. The vessel is fitted with four (two twin) missile launchers. The KCR-60M class was initially believed to be deploying either the C-705 or C-802 missiles, but there were conflicting reports from Jakarta regarding the confirmed choice of missile. "It is the C-705 for now. There are no plans to deploy the C-802 as yet," the TNI-AL official said. The KCR-60M class is also armed with one 57 mm main gun on the foredeck and two 20 mm guns aft. During an interview in Jakarta on 13 August 2014, then TNI-AL Chief of Staff Admiral Marsetio told IHS Jane's that the navy was looking to procure at least 16 KCR-60M vessels by 2018, subject to funding. The platform is seen as a core component of the country's 'Minimum Essential Force' strategy that it plans to deliver by 2024. 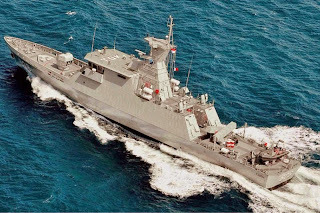 The Republic of Indonesia Navy KRI Tombak (629) KCR-60-Class guided missile fast attack craft.